Experts from NYU Stern School of Business analyze new financial regulations and what they mean for the economy. The NYU Stern School of Business is one of the top business schools in the world thanks to the leading academics, researchers, and provocative thinkers who call it home. In Regulating Wall Street: The New Architecture of Global Finance, an impressive group of the Stern schools top authorities on finance combine their expertise in capital markets, risk management, banking, and derivatives to assess the strengths and weaknesses of new regulations in response to the recent global financial crisis. Provides analysis of how the reforms will affect financial firms and markets, as well as the real economy. The U.S. Congress is on track to complete the most significant changes in financial regulation since the 1930s. 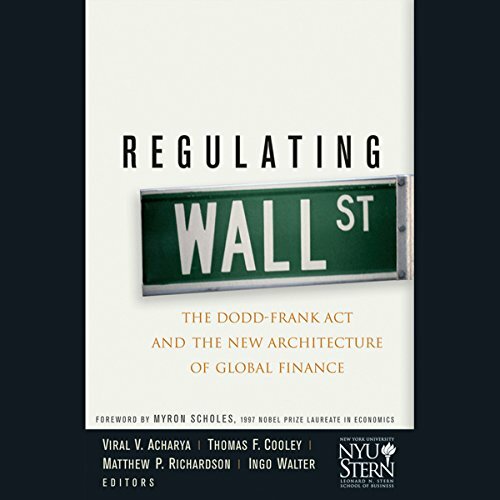 Regulating Wall Street: The New Architecture of Global Finance discusses the impact these news laws will have on the U.S. and global financial architecture. ©2011 New York University Stern School of Business (P)2012 Audible, Inc. I have found no better explanation of issues in the financial services industry (and its regulation) in recent times. The authors move briskly between relevant history, summaries of the Act's provisions, and commentary, highlighting weak spots. The familiar names, Lehman, AIG, etc., appear alongside the Act's attempted fixes. I think it needful, going in, to be reasonably literate in the terminology, concepts, the main players, and the basic narrative of recent years. It is too dense (though clear) to be a starter on these topics. For a more beginning listener, I would recommend "Managed by the Markets."